(STAIN SOLUTION #1) is a non-acidic product for removing iron, cobalt, and spot-etching stains from all types of pool surfaces without draining the pool. The Iron, Cobalt & Spot Etching Stuff will normally remove these stains easily and effectively within 48 hours, with minimal rebalancing of other pool chemical products. 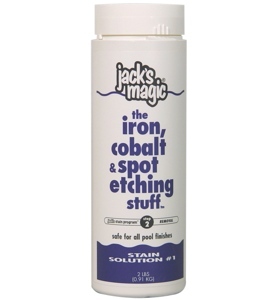 Is it safe to swim after I use the Iron Cobalt & Spot Etching Stuff? No. Do not swim while doing a #1 Treatment. You may swim after the stains have been removed and after your water chemistry is back to normal. Help! My stains turned black after I used this product! Your stains turned black because you have copper stains instead of iron ones. Please use our Copper & Scale stuff. Generally, if the chemistry is adjusted properly, a Stain #1 treatment should be fully reacted within 48 hours. What happens during the treatment if my dog gets into the pool? When doing a Stain #1 treatment there are no adverse conditions that would harm a pet. The reason we don’t advise swimming during a Stain #1 treatment is because the Chlorine level is lower than recommended levels for swimming. When doing a #1 treatment, is it a good idea to wait for the Chlorine to come down on its own? No. This is a common mistake made especially in the warmer months. 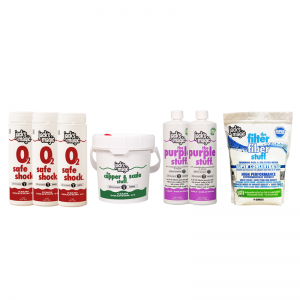 By not using After Shock Chlorine Remover, you will create a significant chlorine demand which may create an algae problem. By using After Shock you can immediately lower the chlorine level and start the treatment the same day. NOTE: The use of a sequestrant is required to filter out the stain. 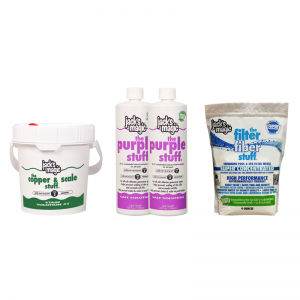 Try our Magenta Stuff, Pink Stuff, Blue Stuff, or Purple Stuff. For technical information about treatment instructions click here.